This new company sells custom letters & greeting cards on a miniature scale. They print tiny, high-quality letters on-demand and mail them out later on behalf of their customers. FLORIDA — Coinciding with National Small Business Week, Miniature Mail has announced their new small business: a tiny custom letter design & mailing service. The company calls themselves “The Littlest Postmasters”, and wants to help you send something special. 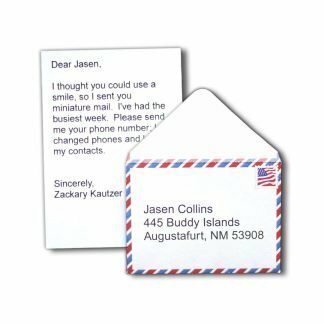 Their website—https://www.miniaturemail.com—features an online editor to help write the perfect miniature message; each order can be customized with a selection of styles and scheduled to ship on a future date. Say hello to adorably small birthday cards & holiday greetings. In today’s world of buzzing technology and instant access to the internet, email, text messages, etc., personal and thoughtful correspondence is a thing of the past; actual paper letters are a novelty. Miniature Mail adds to novelty the element of whimsy, which together deliver a truly unique and meaningful experience. To try it out for yourself, visit the website at https://www.miniaturemail.com. I love the concept, but what can I do with a tiny letter? I’m glad you asked! Below you’ll find a brainstorming list of potential uses and ideas to spark your imagination. Don’t let this get in the way of your own creativity though—the possibilities are endless! We love to hear about how our customers are enjoying their little letters, so send us a photo or a story about your awesome idea! 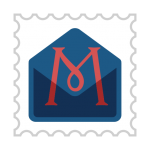 You can also tag photos on social media with @miniaturemail and #miniaturemail.